The mightily compact Atom turned up a little unexpectedly. 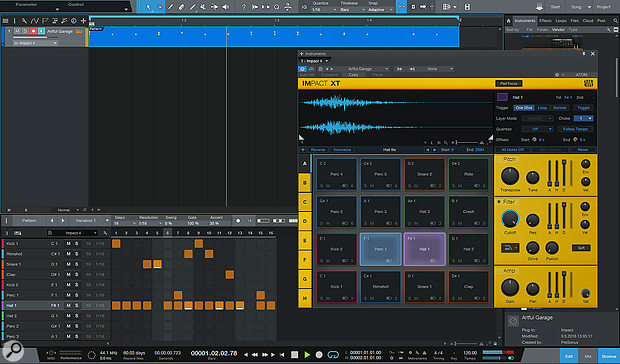 PreSonus have been pushing the seriousness of their DAW and the professional level of their hardware for some time now, and a colourful box of pads seems slightly at odds with that. But delve beneath the colourful exterior and you'll discover an engaging workflow that has a lot more in common with the FaderPort. It would be a mistake to see it as a toyish beat controller; the Atom has a lot more going for it than pretty light-up pads. The Atom is a 4x4 MPC-style pad MIDI controller, but it's the tight integration with Studio One that really sells it. You could see it as a hardware projection of the Impact XT software sampled drum instrument. Playing percussion is always far more satisfying on a pad controller than it is on a MIDI keyboard. But there are also buttons and modes that let you build up tracks without as much as a glance at your mouse. And it's in that workflow that the Atom really works its magic. But first, the basics. Load up a kit into Impact XT and the Atom lights up in response with all the same colours as the GUI. You can then get to work on the nicely responsive velocity‑sensitive and pressure‑sensitive pads. Each pad turns white as it's triggered, making for quite a disco dancefloor in response to your finger‑tapping skills. You don't have to strike the pads with much force to get them to work, in fact you can trigger them with just a slight push. The pads feel right, a little smaller and wider spaced than those on NI's Maschine, but good and chunky beneath the fingers. The build of the Atom is solid and unyielding with a nicely low profile, and feet sticky enough to keep it from moving around. I did find a little bit of 'crosstalk' between pads; if I pulled down on the bottom half some of them had a tendency to trigger the pad above. But that's more of an anomaly when trying to find fault with a device rather than something you'd hit upon when playing. At the top are four tapered encoders that feel solid, although they are the only parts of the Atom not lit and so tend to be difficult to see, but with encoders you're working more with feel than with accurate positioning. In Impact XT these are pre-mapped to the amp gain, panning, pitch and decay, and work on the currently selected sample or last triggered pad. There are a couple of performance control buttons on the left. The first one enables Full Level mode so the samples are played at maximum velocity however hard you play. The second is Note Repeat, which turns the bottom two rows into ratcheting options for the last played or selected sample. They make for easy inputting of rolls and fills into patterns and have some live performance potential if you have fast fingers and really know what you're doing. It's at this point that I start to lose time playing with the kits, like you do with any well-crafted integration between software sounds and a controller. What keeps you focused on the Atom are the function and navigation buttons. The Atom is not trying to be a comprehensive DAW controller, instead you have just enough to keep your hands off that mouse while putting together multiple tracks of beats and patterns. All the pads have additional functions printed on them, and these become active depending on what buttons are pressed or held. Starting with a blank Song, press the top‑left Setup button and tap pad 13 to show the Browser. On the right are some navigation buttons, so you can tap Down to find Impact XT in the browser instrument list, tap Right to open the presets and then Down/Up again to find the kit you're after. Hit Select to load Impact and the kit onto a new track. The GUI comes up and you're off finger tapping. You can step through the preset kits by holding the Preset button and making use of the navigation buttons — no need to refer back to the Browser. Holding the Bank button illuminates the bottom two rows that represent banks A‑H, and you select the Impact drum kit bank with a tap. The Atom works well with Studio One's Impact XT instrument. When you are ready to record you can either insert a pattern, which we'll come to in a minute, or simply hit Record and do your thing. There are four transport controls in a column on the right, each with a dual function that you access by holding the Shift button. At the top in blue you have Click enable and Shift to enable a Count In. Next you have Record in red with Save under the Shift function. Green is for Play and Shift enables loop playback. Lastly, Stop is yellow, and also has the enormously useful Undo function when used with the Shift button. Once you've finished recording, press the Event Editor button to open the drum editor and now you can use the navigation buttons to step through the notes and move them about. In this mode only pads 9-12 are lit, offering Duplicate, Delete, and Velocity + and - for the currently selected note. A Nudge button helps you push and pull notes, and using Shift will snap the note to the quantise setting. While the functions are fairly basic there are just enough buttons to enable you to record and edit a drum part without having to take your hands off the Atom. The Atom is perfectly suited to Studio One's Pattern Sequencer. Pressing Setup + pad 5 inserts a pattern at the current song position. Pressing Shift + Set Loop puts the loop markers around the pattern and pressing Editor brings up the pattern editor and enables sequencer mode. Instead of a colourful drum kit you now see each drum lane available as a 16-step pattern spread over the 16 pads. Turn the steps on and off, add accents with the use of the Shift button, use the navigation buttons to change lanes or groups of 16 steps. It's a very smooth pattern-building experience. What isn't served by the Atom/pattern experience is the automation lanes. As you can't select individual notes in a pattern (they turn on or off) there's no way to direct a controller to step parameters such as Repeat and Probability. You can't, for instance, hold a pad to enable the step of a snare and then turn a knob to alter the probability. Those sorts of things are still in the domain of the mouse. You can do regular track automation with the four knobs, but only on regular track and instrument parameters — you can't map them to those two key pattern parameters. It doesn't have to be all about Impact XT. Atom will happily work as a clumsy pad-based piano keyboard. It works well enough to write melodic parts and chords. You can load an instrument such as from Mai Tai using the Atom, just as you did for Impact XT (with browsing), and it generates a new track ready to go. The first 13 pads become notes of a scale, with white notes in yellow and black notes in blue. Pads 15 and 16 become transpose up/down buttons. Knobs 1 and 2 are automatically assigned to cutoff and resonance, and you can map all four to whatever you want. It was at this point that I ran into a bit of trouble. The mapping of the knobs didn't seem to stick. After a bit of fiddling I discovered that the Atom's knobs would only control parameters when the instrument GUI was in focus. This was true of Impact, Mai Tai or any other instrument I was using. I probed PreSonus about it and they said it's because the knobs function differently in different control layers. For example, knob 2 controls Tempo in the Song Setup layer. So, in order to prevent conflict they decided to have them active with whatever was in focus. This means you can have the knobs mapped to something globally that is different to how they are mapped when the instrument is in focus, which brings in some unexpected versatility while still being a little annoying. Timeline recording is as you'd expect, and when you press the Editor button it now brings up the regular piano roll view. You can navigate the editor and edit notes and velocity, just as you did in the drum editor. Moving notes around, quantising and simple actions are all very easy. When you close the Editor you can then use the same buttons to navigate in the timeline and can use the same Duplicate and Delete pads to do a bit of arranging. You can step up and down through tracks, duplicate clips and insert patterns and select what you want to edit next. The Atom is no replacement for all the tools and possibilities of your regular mouse and keyboard combination, but you can nip around and do some basic editing all from the controller. You can use the Pattern Sequencer with non-Impact instruments, but it's not quite so fully formed as it is with drum sequencing. When you bring up the pattern editor on an instrument track the pads all go grey and unlit, which doesn't really inspire confidence. If you disengage the Editor button it doesn't close the pattern editor, it just puts the pads back into play mode. If you then enable Step Record with your mouse you can use the pads to enter a pattern of notes step-by-step. What's missing is a button to enable Step Record and also a button to enter a Rest. But this is where your secret user functions come into play. They're not really secret, but they feel like a discovery when you first stumble upon them. 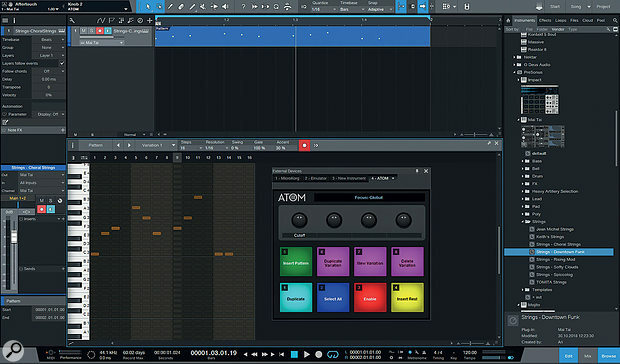 The Atom's Melodic Step Record mode in Studio One. Pressing the Song Setup button turns the pads into buttons to access things such as tempo and the Browser. The bottom two rows of pads (1‑8) are actually user definable function buttons. By default pads 5‑8 are set to insert patterns and create variations. Pads 1‑4 cover Duplicate, Select All, Mute and Solo. You can access and edit these via the External Devices window in Studio One. This is also where you can map the knobs to things. So, prompted by the lack of dedicated Step Record and Rest buttons I set these up here in order to give me a fuller melodic pattern experience. Right-click a pad and choose Assign, search for 'step' and under Step Record you can assign 'Enable' to pad 3 and 'Insert Rest' to pad 4. You can change the pad colour if you wish, and you're ready to go. I'd very much like to see those two functions incorporated into the main interface somewhere, but the User Functions are very handy and give you the space to create the shortcuts to the tools and actions you need in your workflow. 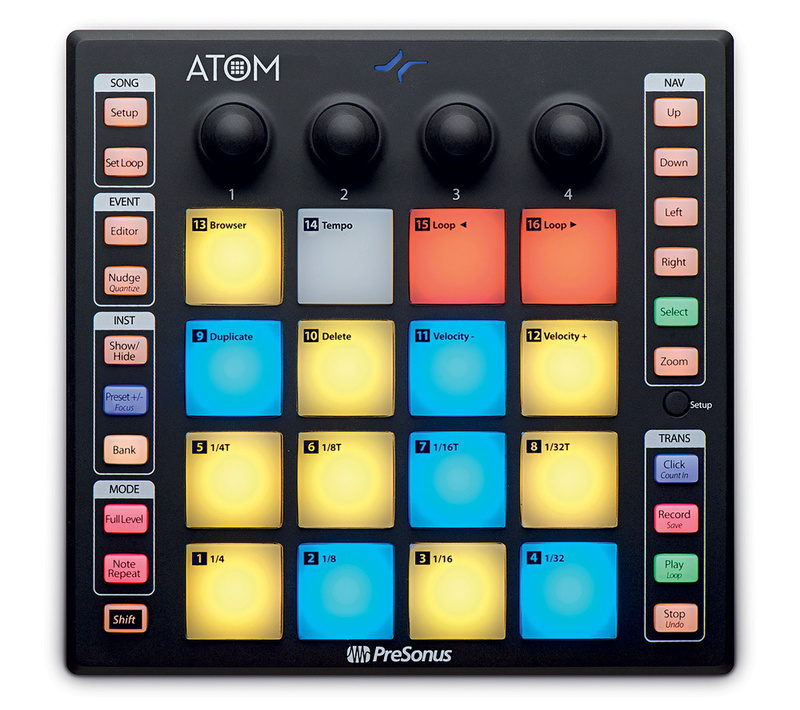 The Atom is also a regular MIDI controller. The pads put out MIDI messages and all the knobs and buttons are similarly assigned. There's no particular cleverness about it, no automatic mapping, or Komplete Kontrol or VIP style plug-in wrapper, and it doesn't even use Mackie Control for the transport. But it still plays really nicely in other DAWs and with other virtual instruments. There are a few modes and adjustments you can make to smooth out your non-Studio One experience. Under the only non-light-up button on the Atom are the background controller settings. Here you can swap between drum pad layout and keyboard layout, and you can adjust the pads' velocity curve, pressure mode and responsiveness. I found that, when using the Atom with kits in Bitwig Studio Drum Machine, it needed a softer velocity profile, which I could access in the Setup. Note Repeat still worked well and velocity was automatically mapped to pad pressure. Mapping the knobs was all very easy; this doesn't have to be all about Studio One. The Atom is a little powerhouse of pad‑oriented control. Being made by a DAW company gives it that deep integration with Studio One that's very enticing. It creates an easy workflow and the secure and uncommon feeling that it just works. The compact size is a definite advantage — you can whip it out when you want to use it and it's not going to take up an annoying amount of space on your desk. And yet they've managed to squeeze in enough functionality to keep your hands off the mouse and your fingers on the pads. It's not going to fulfil the role of a DAW controller, but then that's not its job. There could be some deeper control in the Pattern Sequencer (accessing those Repeat and Probability functions would be nice) but PreSonus say these are things they are looking at, so there could be more around the corner. Outside of Studio One, the Atom works remarkably well as a simple pad controller, so while it's a no-brainer for beat makers in Studio One, users of other DAWs are not getting a raw deal, just a simpler one. Small footprint but solid build. Impact XT integration is fabulous. Enough buttons to let you ignore the mouse. Decent pad controller for other DAWs. Could go further with Pattern Sequencer. Needs GUI in focus to respond to knobs. The Atom is a usefully compact pad controller for Impact XT and the Pattern Sequencer in Studio One, and can also hold its own in other DAWs and with other instruments.